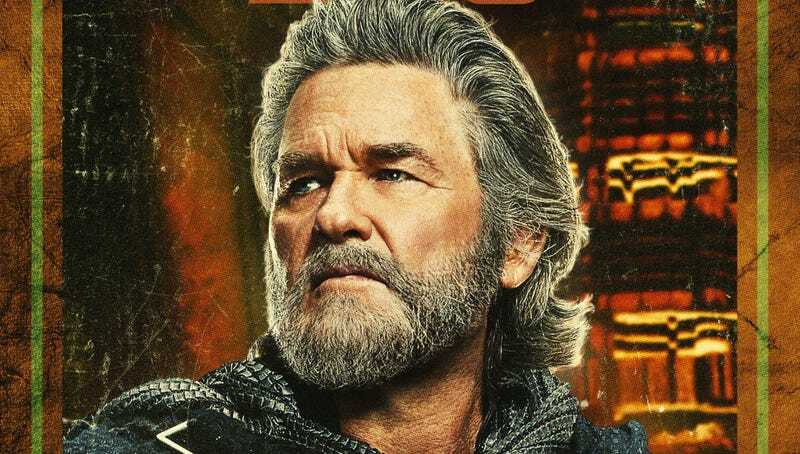 Kurt Russell is known for his iconic roles in countless movies, whether he played a badass (The Thing, Tombstone, Escape From N.Y.) or a goofball (Big Trouble in Little China, Overboard, etc.) He’s one of the very rare stars who can be cool and funny simultaneously—and Russell thinks Chris Pratt is like that too, which is why they’re the perfect father-son duo in Guardians of the Galaxy Vol. 2. He was, however, writer-director James Gunn’s first choice to play the father of Chris Pratt’s hero. When Russell finally watched the first Guardians of the Galaxy movie, he immediately felt a connection with the star. That kind of goof came from those aforementioned characters Russell played in like Snake Plissken and Jack Burton. These roles are now iconic, but at the time the movies were released, Russell admits many people didn’t quite get his performances. So to be at this point in my life and be able to not only... have a generation that accepts you for what you were doing before anybody else was... to be able to take that and grow that, it’s nice. Because it has a lot to do with my personality and the way I look at life and stuff. And so, it’s a nicer time for me than it was 30 years ago... and yeah, it’s a bit of an opportunity to take advantage of the way I created some guys in the past that you guys, the people your age are more in tune with. You understood it. There are as many connections between Russell’s character, Ego the Living Planet (yes, an actual planet who can take a human form, because comics) and Star-Lord as there are between Russell and Pratt’s performances. Given that he’s joining an incredibly anticipated sequel, the immensely popular Marvel Cinematic Universe and the fact Russell is playing a literal planet, his nonchalance seems almost shocking. But for him, a planet is just another role for the actor, albeit one that’s likely to be as iconic as his others. Chances are, Russell doesn’t need to worry about Ego’s appearance in Guardians of the Galaxy being any of those things. After all, like son, like father. Guardians of the Galaxy Vol. 2 opens May 5 and tickets just went on sale.